Discussion in 'Fur Pictures and Videos Only!' started by Lucifigus, Mar 11, 2018. This is a remarkable photo of Oz with the brilliant sunset and all, and Oz being a remarkable cat! dustydiamond1 and 1CatOverTheLine purraised this. golondrina, Pixie_kitttie, Jayflower and 9 others purraised this. Admittedly not a very good photo, but it was the only way I could fit both cats in. Pixie_kitttie, Jayflower, Shane Kent and 7 others purraised this. golondrina, Pixie_kitttie, Jayflower and 8 others purraised this. Chula reveals her extraterrestrial origin. golondrina, Jayflower, Korinmewmew and 7 others purraised this. I like trying for silhouettes. Here is another of Lucy. Here is an old photo of Chessie hanging out in the old shop with me. In those days the shop was right outside the kitchen door and She spent many days keeping me company as I worked. Her usual spot was on the stereo tuner, but here she is sitting on a clients steam locomotive. @Jack B - Gives an whole new meaning to The Chessie System, eh? Shane Kent, dustydiamond1, raysmyheart and 1 other person purraised this. The closest I've ever come to a silhouette is what is now my avatar. Pixie_kitttie, Jayflower, white shadow and 5 others purraised this. My beautiful Chessie was named after the famous Chessapeake & Ohio cat Chessie. We were at a train meet with tiny Chessie the kitten, ( as yet unnamed ) and she was cruising around with me in my coat with her little head poking out. An old friend walked up and said, " is that Chessie? " I thought for a minute and said, " I think so ". She was still a very tiny kitten with blue eyes, too tiny to leave home alone as we were still bottle feeding her ( just about the cutest thing you ever saw ). The name stuck. golondrina, Shane Kent, dustydiamond1 and 2 others purraised this. 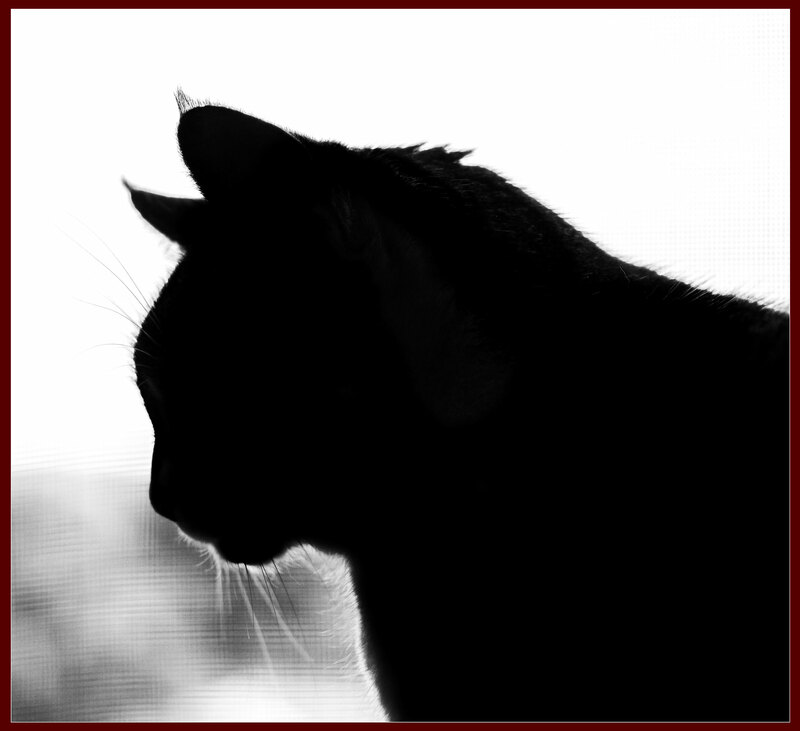 I made a little silhouette video of my cat, Milly, when she was a youngster... she was trying to attack a little "shadow dot" showing up on the interior of the curtain! Jayflower, white shadow, Shane Kent and 5 others purraised this. Pixie_kitttie, Jayflower, white shadow and 7 others purraised this. Pixie_kitttie, dustydiamond1, Jayflower and 6 others purraised this. Kitty in the window at work. golondrina, Pixie_kitttie, Jayflower and 7 others purraised this. 1CatOverTheLine and PushPurrCatPaws purraised this. golondrina, 1CatOverTheLine and dustydiamond1 purraised this. Shane Kent, Pixie_kitttie, Jayflower and 5 others purraised this.